Flared mouth and broad bottom supported by a flared hollow foot. Inside the bowl, a lotus pattern is painted in the center and there are Ruyi patterns around the rim. Outer surface painted w/flowers and twigs separated by lotus pattern. Four Chinese characters reading from right to left Xuande Nian Zhi (Made in Xuande period) beneath the rim. Bowl is well shaped and the color strong. Ferric oxide spots are obvious. 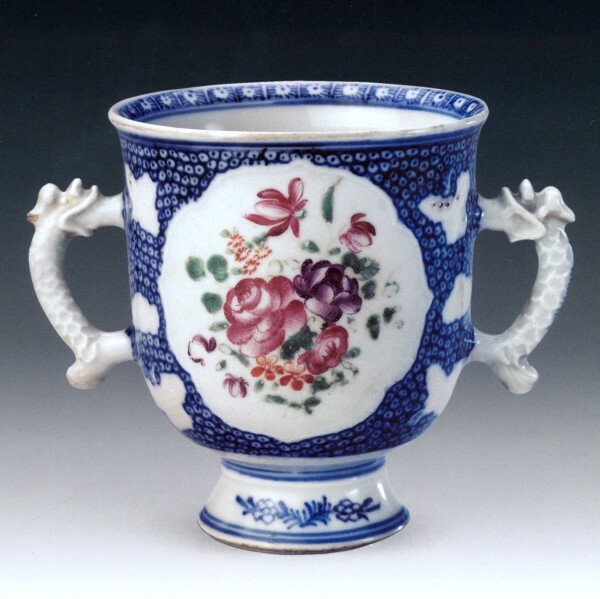 Typical of Xuande blue and white porcelain of Ming period and very popular in later generations. There were lots of imitations during the Ming and Qing dynasties, among which, those made in the Zhengde period of the Ming and Yongzheng period of Qing dynasties were most close to the original. Slightly raised brim and a round bottom. On the surface of outer bottom, the Chinese character Yu (Jade) written in Kai style. 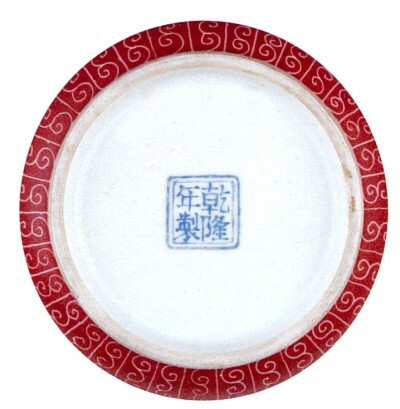 Decorated w/blue and white patterns outside, plate has a diamond pattern around the rim; inside is a peony w/leaves. Central motif is landscape w/pavilions and human figures. Four flowers are painted on outer surface. It is light but strong. Beautiful and fresh in blue and white its design; pattern and painting style typical of exported porcelain. Narrow, long neck, round belly and round foot. On one side, a bulbous shaped spout. Overall white glaze and polychrome flower and bird patterns, elegant and natural. Mouth and spout are lidded and decorated with silver. Silver chain links the spout and mouth. Junchi was popular in late Ming and early Qing dynasties and used as water containers in Buddhist tradition. The white glaze and the red design present a solemn elegance. Flared mouth, round body and round base. 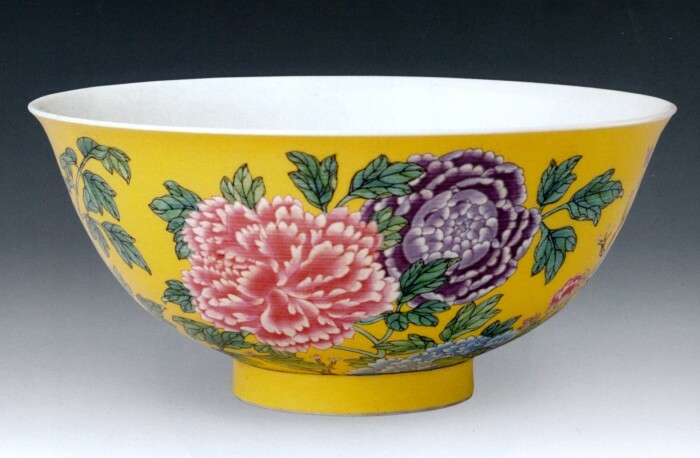 Outside surface is yellow enamel decorated w/peony pattern; inside is white glazed. Outer surface of bottom is inscribed w/four red Chinese characters Kangxi Yu Zhi (Made by imperial order of Kangxi.) 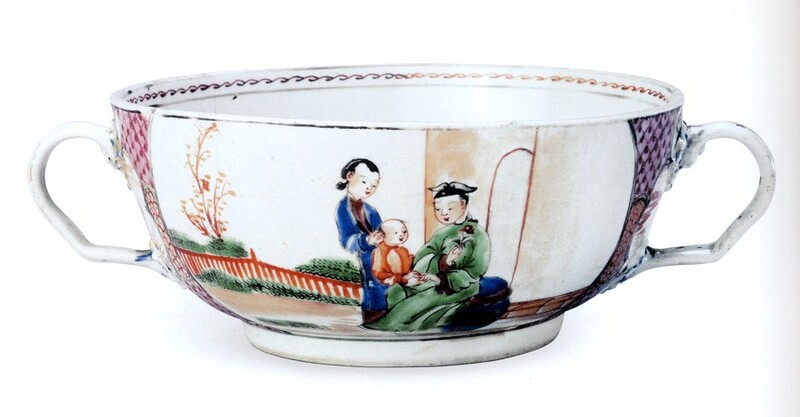 Porcelain with painted enamel technique started in the Kangxi period and required very high skills; it was, therefore, reserved for the imperial family. The coloring material used in painted enamel had to be imported at that time. 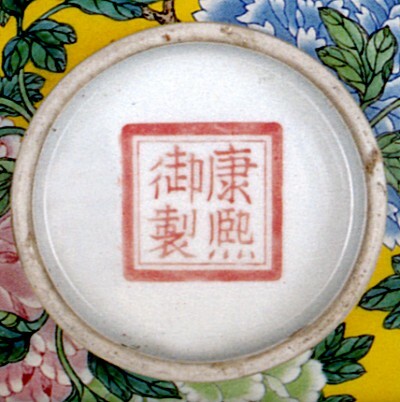 Fascinated by Western technology, Emperor Kangxi ordered this beautiful decoration technique used on porcelain. This bowl is refined and well painted. The peony looks real against the yellow background. This decoration style reveals imperial taste of the time. This bowl has a flared mouth, deep body and round foot. Inside bowl is white glazed w/o decoration. Outside decorated w/flowers on red background. 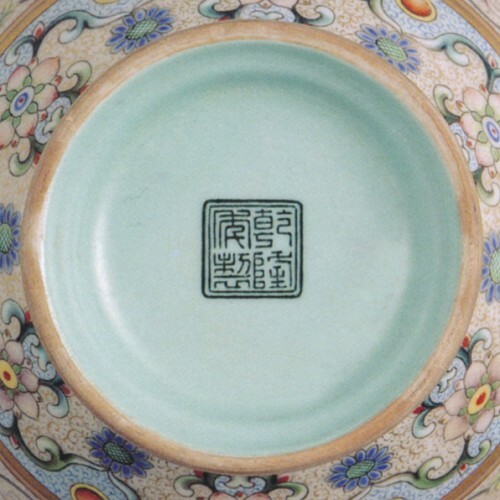 Outer surface of bottom is inscribed w/four Chinese characters in blue Kangxi Yu Zhi (Made by imperial order of Kangxi.) Design is well organized, richly colored and vividly painted--a good example of the painted enamel porcelain of Kangxi period. Slightly flared w/no mark or seal. In the center is mid-length portrait of a Western lady in semi-profile wearing a shawl, necklace and hair ornaments. There is a circle of gilded border on a red background near the rim and another beaded pattern in green and red. The outside surface of the plate is smooth and undecorated. 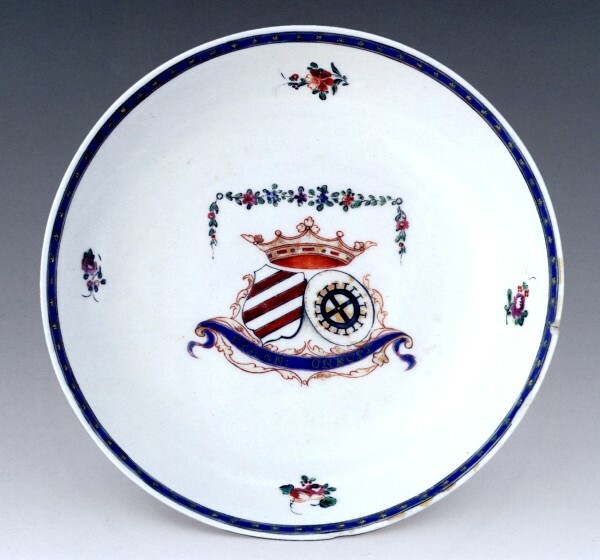 Porcelain with initials or armorial designs in the center is known as armorial porcelain. The decoration design was brought to China by European merchants and painted by Chinese artists. It is white and exquisite, well painted in purple, blue and green. 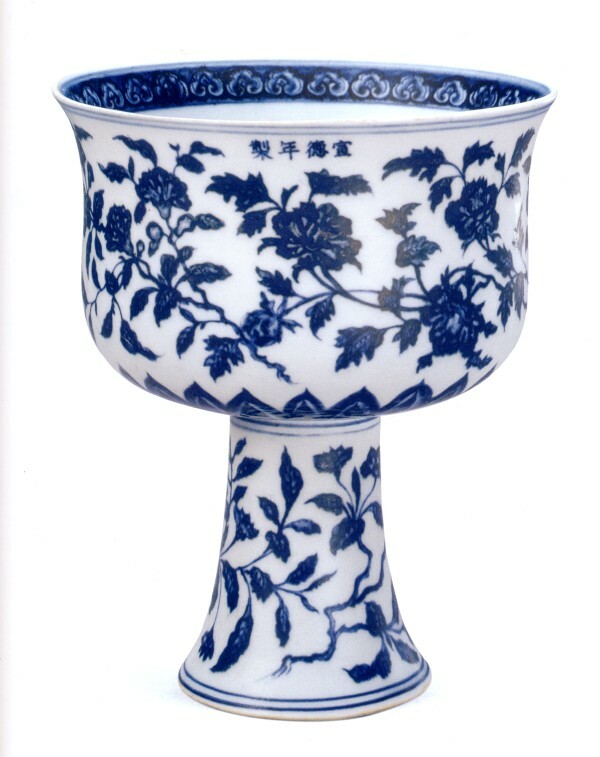 The design is highly decorative and Occidental, suggesting the flourishing development of porcelain export in the Qianlong period. This plate has a slightly raised brim and is without any year mark. There are gilt flower patterns on the blue background around the rim. Four famille rose flowers are placed evenly on the inside surface of the plate with a famille rose crown under a garland canopy. There are two shields below the crown. The inscription on the blue ribbon is SPAAN: ONRUSI. The outer surface is smooth without decoration. With bright and green glaze in a formal shape. Made for the European market during the Qianlong period. This cup is deep and slightly flared. Inside, it is white glazed and decorated with blue beaded patterns around the rim. The outside surface is a blue background with famille rose flowers painted in white medallions. The inner surface of the base is also glazed white. 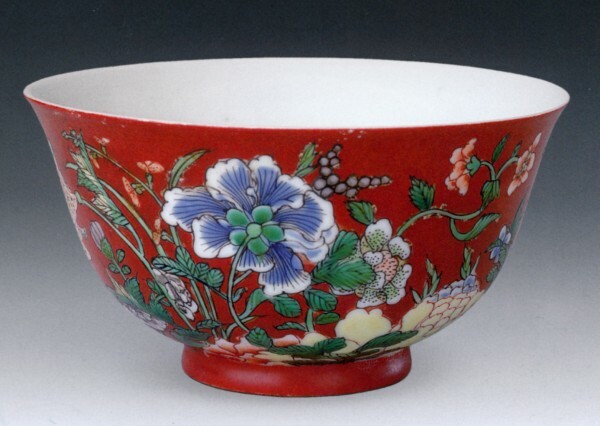 An example of the best Canton coloring technique, it is beautifully decorated and vividly glazed. Decorated with two ears. There is no mark inside the white glazed base rim. A red coiling grass pattern is painted around the inside rim. There are two groups of painting on the outer surface. Beneath the two ears are landscape and flower patterns. The central features are two symmetrical paintings. One is a pleasure garden with green grass and a tree. A scholar sits on a stone stool with a teacup in his hand. A maid stands next to him holding a tea tray. The other painting is of a child's lesson in the garden. A couple is teaching their son; the father is sitting with a flower in his hand while the mother stands close with her hand on the head of the boy who stands next to his father. The heavy, strong glaze, together with the shape and painting style, reveal the export nature of the bowl. 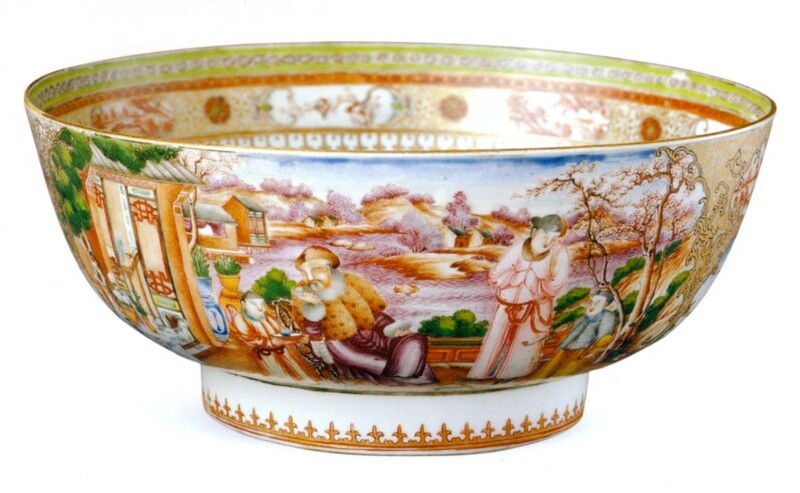 This round, deep bowl is decorated with Canton coloring on all sides with Western landscape and figure paintings. The bisque ware was first made in Jingdezhen and then transported to Canton. 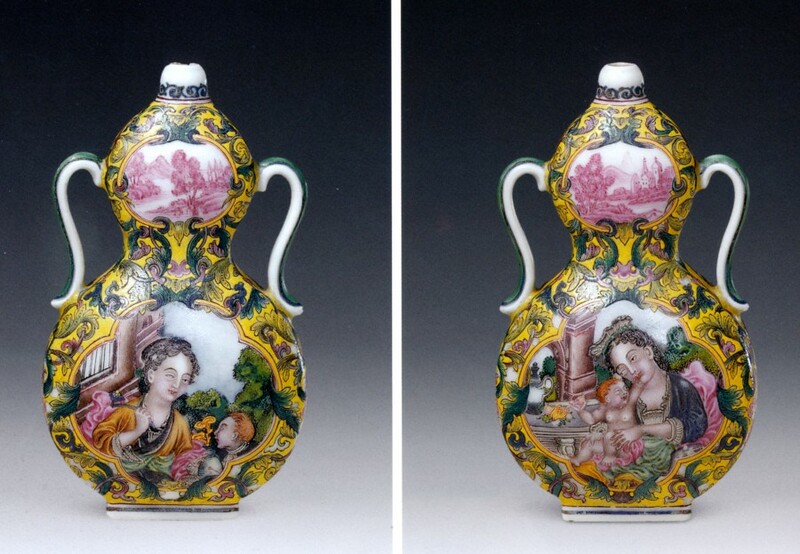 Artisans painted it in Western styles and had it fired on the southern bank of the Pearl River. That is how Canton coloring came into being. 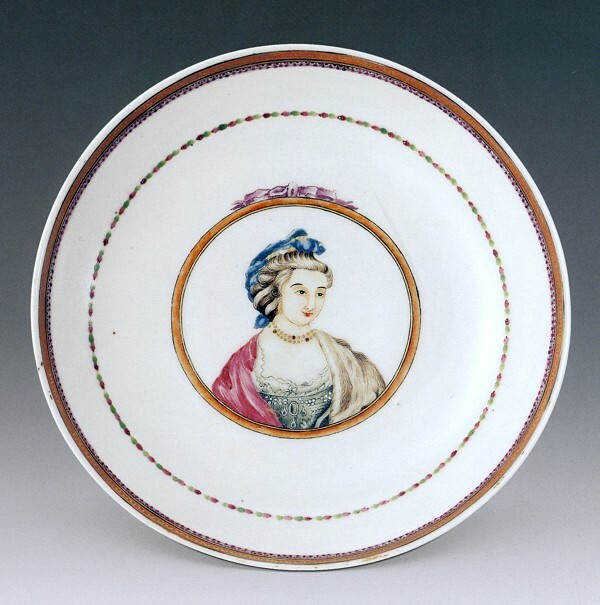 The porcelain colored in Canton was for export. The most common colors were red, green and gold with Western style decoration. In the form of a gourd, the vase has a small mouth and square bottom with two symmetrical ears. There are four groups of paintings on the yellow background-smaller landscapes on the upper part and Western figures on the larger lower part. The pattern of curling leaves is used to separate the paintings. 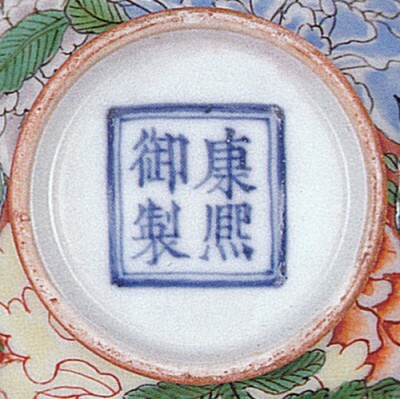 Four Chinese characters in Kai style Qianlong Nian Zhi (Year mark of Qianlong's reign) are written in blue on the outer surface of the bottom. Oil painting skills were used in vase decoration. 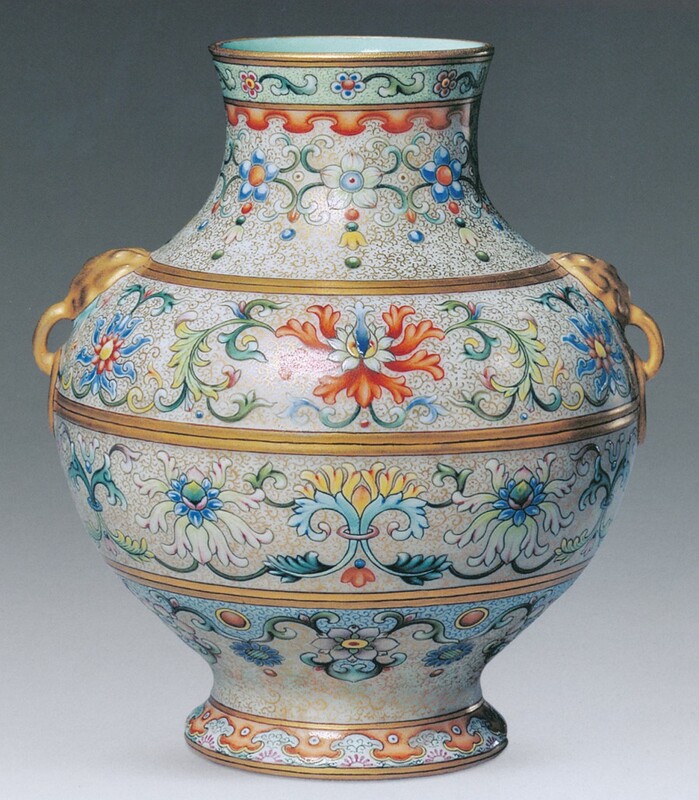 Vivid color and perspective techniques made the vase a rare piece of art of the painted enamel porcelain in the Qianlong period. This vase has a slightly flared mouth and a narrow neck. The belly is like a barrel and the foot is round. 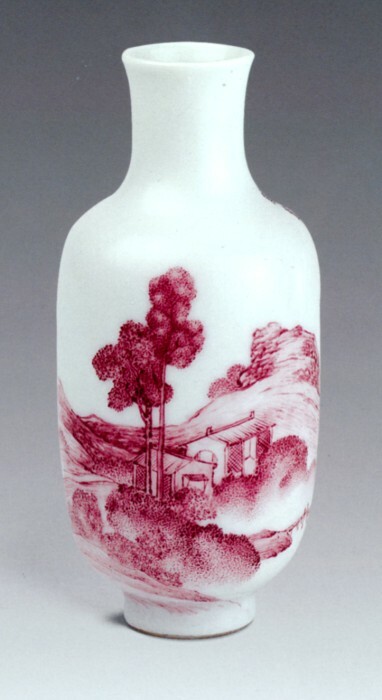 The overall glaze of this vase is white with decorated with a landscape painting in red. Where the neck meets the body, is a poem line inscription Wan feng qing lu dian (Dewy mountain top on a clear evening). There are several seal inscriptions and four Chinese characters Qianlong Nian Zhi (Made in Qianlong Period) written in two lines on the outer surface of the bottom. The vase has a slightly flared mouth, short neck, round belly and high foot. The outer surface of the vase is coated with deformed lotus patterns on a gilt background. The inner surface of the vase is turquoise glazed and decorated with several gilt loop and a pair of ears at the shoulders. Four Chinese characters Qianlong Nian Zhi (Made in Qianlong period) are inscribed in black on green on the outer surface of the bottom. 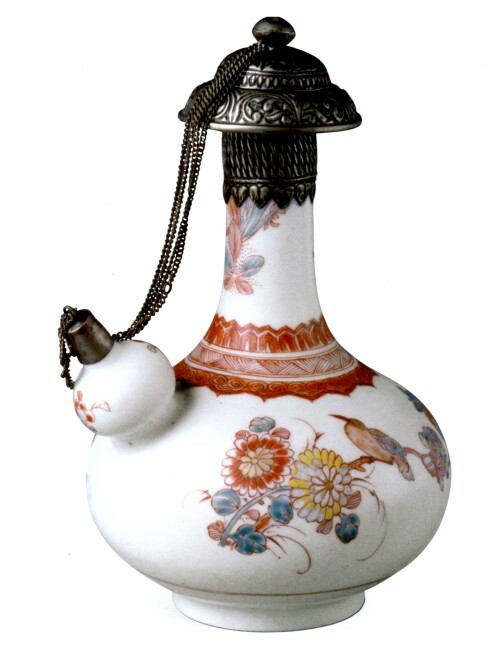 This vase represents the best of the enamel painting technique in the late Qianlong period. The shape of the vase is an imitation of the ancient bronze. However, the flower patterns on the gilt background represent the glory and extravagance of the Qing court in Qianlong period. The mouth of the teapot is slightly flared. It has a round body and base. 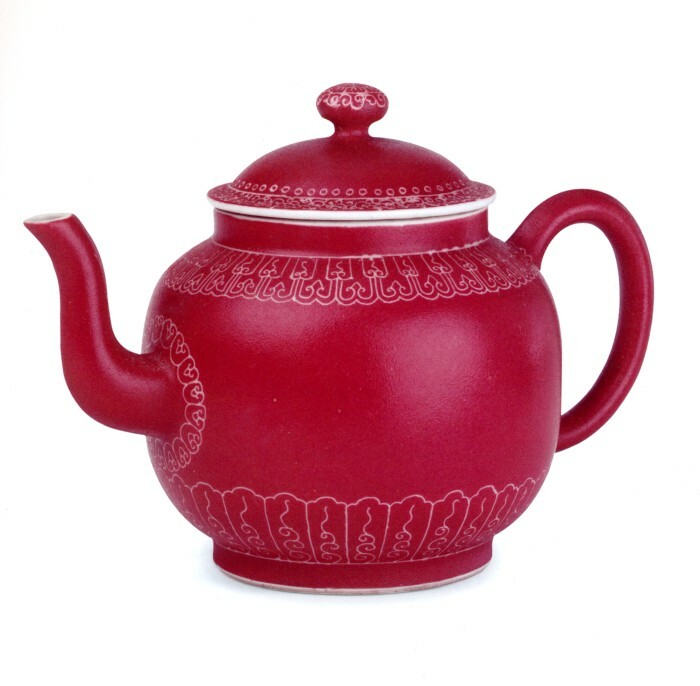 The surface of the teapot is a ruby red color with patterns of banana leaves around the shoulder, bottom and spout. The lid is round and decorated with curling patterns, its top surrounded by petal designs. 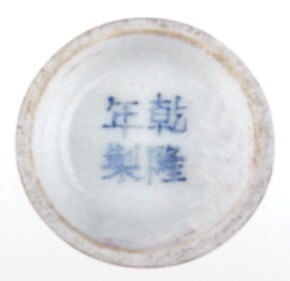 On the surface of the bottom, are blue inscriptions of Qianlong Nian Zhi (Made in Qianlong period) in Kai style. Enamel teapots of the Qianlong period, especially those of monogram design, are rare. This fine teapot is definitely a work of art.